Hilliard is named after the man who purchased 10 acres of farmland in 1852 with the express interest in creating a village that would take advantage of the new Piqua and Indiana Railroad that would soon pass through the area from Columbus on its way to the Indiana border. John named the new village Hilliard Station, after himself. The first section of the railroad from Columbus, passing through Hilliard's Station, northwest to Plain City, opened June 6, 1853. In September of that year, John Hilliard platted out 200 lots to be sold to new residents. The following year, Hilliard's Station acquired a post office, and the word "Station" was dropped from the name as was the apostrophe "s". Although the apostrophe "s" was dropped when "Station" was dropped, even today, many people stil refer to Hilliard and Hilliards. While the first train station at Hilliard's Station was nothing more than a few boxcars, the original constructed train station has been restored and remains in Hilliard’s historical Weaver Park. Fifteen years later, in 1869 the town had grown to 280 residents. Because the village was just 10 miles from Columbus, the railroad brought some large industrial development to Hilliard. Some of the earliest businesses in the village were a warehouse built by John Hilliard in 1853 and a steam saw mill built by Ralston and Kirkpatrick . In 1892, a creamery was built on Columbia Street. Hilliard officially became a city in 1960 when it was determined the population had exceeded 5,000 residents. When the Outerbelt was completed, Hilliard saw another explosion in growth and today the city has a population around 25,000. Beginning in March 2008, Hilliard plans a major $3 million dollar re-construction project for Old Hilliard designed to infuse new life into the original parts of the city. Plans are to make it possible for businesses to provide street-side dining, additional landscaping and efforts to slow down through traffic in the area. Business Week recently listed Hilliard as the Best Suburb in Columbus to live in thanks to affordability, population, and proximity to the downtown area. The original train depot has been restored and is now located inside the west side of the Franklin County Fairgrounds in the Northwest Village. 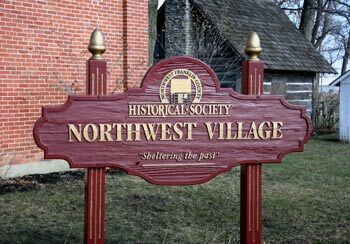 The Northwest Historical Village is operated by the Northwest Franklin County Historical Society, and is a portrayal of pioneer living from 1850 to 1900. The train station, built in 1899, once stood on the north side of the railroad tracks west of Main Street in Hilliard, Ohio. See the newly dedicated "First Responders Park Memorial"
J. R. Hilliard was born in 1817 in Piqua Ohio. Educated in Cincinnati as a civil engineer, John was involved with railroads and mining most of his adult life. Although he founded the Village of Hilliard's Station in 1853, he never actually lived there. In 1871 he married Sallie Mattox from Springfield Ohio and together they moved to Peoria, Illinois where he operated several different railroads in the state. He died of pneumonia in 1901. As part of the deeds that accompanied each lot he created in Hilliard Station was the stipulation that if any liquor was sold on the property, the owner of the property would forfeit their land. John Hilliard, who was a lifelong Prohibitionist, had problems with this clause, he did win every case that he brought to court.